Gezi Park protest: how visual communication helped create a movement? Olu Jenzen and Aidan McGarry. This article is part of Right to Protest, a partnership project with human rights organisations CELS and INCLO, with support from the ACLU, examining the power of protest and its fundamental role in democratic society. The ‘Aesthetics of Protest’ project explores visual culture and communication during the Gezi Park protests in Istanbul in May and June 2013. The protests started as a reaction to attempts to build a shopping mall and military barracks in Gezi Park and galvanised opponents who wanted to challenge gentrification and increasingly neoliberal reforms as well as creeping conservatism and authoritarianism in Turkish society. It is estimated that 2.5 million people participated in the protests in Istanbul, across Turkey and around the world. Protestors occupied the park, exchanging ideas, expressing solidarity, and building community, often in the face of police repression and tear gas. Eleven people died during the protests. Our project explores the ‘performance of protest’ and the intersection between visual culture, art, social media and protest. We are interested in the images of protests documented and communicated by protestors rather than those produced by mainstream media. We explore the importance of social media understood not just as a tool to disseminate information but also as a mechanism allowing people to communicate visually and engage in a non-material space. In this respect, digital technologies expand our understanding of how and where politics is done. For protestors, social media is useful to exchange ideas, share information regarding activities, and raise awareness of a protest. Research has noted how social media offers a space for the creation of ‘counterpublics’ to challenge existing power structures, and for new social meanings to emerge. It is based on the assumption that digital technologies, such as smartphones and social-media platforms, allow people to participate in protest in different ways. Certainly, socio-cultural and political opportunities are transformed by digital technologies, with user-generated content, such as images, memes, videos and live-streaming, being published and circulated on social networking sites like Facebook, Tumblr, Instagram, YouTube and Twitter. During moments of ‘collective effervescence’ (when a community comes together and simultaneously communicates the same thoughts and actions, with a protest being a classic example) users can navigate digital technologies to dissolve geographies and ascribe meaning to activities. In our research we collected over 250,000 tweets sent during the Gezi Park protests in May and June 2013. We then selected 750 images from those tweets and analysed the visual content. We found that 21% of tweets during the Gezi Park protests had images attached, and these images constitute a visual culture where meaning is mediated and communicated. However, there is a tendency for academic researchers to privilege text over images, and by paying less attention to the images being produced and circulated, we often miss much of what is being ‘said’ and communicated by protesters. Images of the whirling dervish with a gas mask were widely published and then recontexualised across social media platforms. Image: Rodi/Depo Photos/ABACAPRESS/PA Images. Mainstream news reporting on protest tends to privilege visual content that dramatizes the event or offer visually spectacular images. As Bart Cammaerts notes ‘mainstream media predominantly tend to focus on violence and on the spectacular rather than the message’. To an extent protest movements play into this as they seek to gain the attention of mass media and its audiences. A case in point from our Gezi Park study are the many pictures of the whirling dervish with a gas mask published across both traditional media and social media. This example illustrates how street performance during protest has a duel function both as theatrical protest activity and as an ‘image event’ (DeLuca 1999), or what we might call a ‘photo opportunity’ and that has an impact beyond the event itself as the images are shared and recontexualised across social media platforms and other media. Thus it could be argued that whilst the street performance in itself is not by any means unimportant, it is limited to a time and a space and the wider impact is achieved through the image, as a mediated visual message rather than as a direct experience or encounter. In the visual output from the Gezi protestors we see a particular rhetoric around resistance evolving, one that expresses non-violence, humour, compassion and investment in a civic code of conduct – what has become known as the ‘Gezi spirit’. These images work to foreground the contrast between the protestors and the brutal violence of the police, and between the protestors’ own stories and the antagonistic portrayal of them as thugs and looters by Turkish dominant media. Some shared images revealed a playful reframing of the term ‘Ҫapulcu’, which had been levelled at protestors by the then Prime Minister Erdoğan. ‘Ҫapulcu Dershanesi’ (meaning ‘Looter Classroom’) is a satirical reference to the perceived bad influence of the activists, but also a symbolic gesture to the ‘re-schooling’ the activists are undertaking themselves in exploring new ways of living, and new ways of expressing oneself in the public space, enacting more emphatic practices of citizenship. The insult was quickly re-appropriated as a positive term of self and collective identification, used on placards and as graffiti, and subsequently shared as images on social media. This helped to fuel the ‘Gezi spirit’, which then provided a framework for solidarity and co-existence for a diverse group of people in the park and beyond. Here the visual communication served as an expression of solidarity, beyond whatever messages or demands were communicated within. 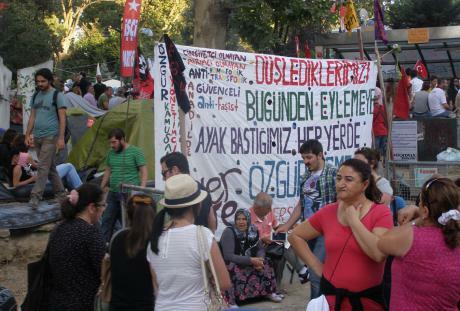 The Gezi Park protests were notable because they brought together a diverse mix of people, including Kurds, Kemalists, LGBTIQ, football fans, Alevi, women, who mobilized in the park, exchanging ideas, and building a collective ‘Gezi Spirit’, one that transcended traditional socio-cultural cleavages. Images shared on social media helped communicate and fuel ‘Gezi Spirit’, in contrast to government propaganda and the mainstream media, which often depicted protesters as hedonistic looters. Image: Chris Vena/Flickr. Some rights reserved. Another key aspect of the visual communication of protest is ‘affect’. The technological means to mobilise, via smartphones and social media, have been emphasised in research on contemporary protest movements. However, to gain an in-depth understanding of the mechanisms of mediated mobilisation strategies and on how politics is performed through protestors’ engagements with aesthetics, we need to pay attention to the emotive register of images. Images are not only about content or indeed representation; they evoke emotional responses. Audiences may even engage with this emotional impact more directly and prior to any representational decoding of an image takes place. In other words, we react emotionally in an immediate way, before we start to make sense of an image. Aiming to evoke certain emotional responses – anger, indignation, sympathy, fear or joy for example – can indeed be a deliberate rhetorical strategy by protestors. Our study seeks to elaborate on the potentials of visual culture and social media in effecting social change, and key to this is to better understand the emotional dimensions of both social media culture and visual communication. Commenting on images of pain, such as images of human suffering caused by war, disasters, or illness for example, McCosker notes that ‘vulnerability facilitates the circulation of sensation as aesthetic force, requires ethical conduct and offers a catalyst for thought, action and sociality’, which arguably also are key aspects of protest mobilisation. An interesting aspect to note in relation to this is that such sensation is not limited to the types of images that are visually spectacular, but is also frequently conveyed in the mundane, the humdrum or the everyday. The notion of communication through affect – in an image from an everyday life environment – is illustrated in an image we found of some people stopping on the sidewalk to attend to one of Istanbul’s many street dogs during the protests. Here the emotional register dominates; a helpless animal suffering the effects of having been exposed to tear gas, used by the police against the protestors, is implicated in a political message about the brutality of the police. Several of the protest images we found featured animals. A somewhat unexpected finding in our research has been the quantity and richness of images of everyday life in relation to the Gezi Park protest. We think these images – rather than forming excess material or digital slush in the protest-related twitter output – are significant; they play an important role in communication, pertaining to the protestors’ (counter-culture) self-image and to their world-making or cultural-meaning-making processes, as well as their re-signification of political discourse that has been used against them. In all these respects the images of quotidian life in Gezi Park are performative. Image: Michael Fleshman/Flickr. Some rights reserved. Mundane images of eating, sleeping, cleaning, reading, exercising, gardening, praying and so on constitute detailed signifiers of ‘Gezi spirit’ as performed and embodied, and simultaneously hold the utopian notion of an alternative way of life and ways of being in public space. Framed as visual responses to the government’s portrayal of the protestors as a mass of hedonistic looters void of any real political agenda, mundane activities become acts of resistance, which are documented and disseminated across social media platforms. To conclude, the large proportion of Gezi park tweets that include images tells us this is an important part of protest communication also beyond the protest location itself. When we delve into the types of images tweeted by protestors we can see not only that there is a wealth of different types of images circulated – from creative collages to documentary photography – but that different modes and styles of visual communication are used for different purposes: for example dramatization and humour are used to connect with larger audiences whilst images of the everyday have proven to significantly contribute to the protestors construction of the movement’s identity and shared notions of ethics in the sense of ways of being. Images: The Aesthetics of Protest’ project examined shared images of everyday life during the Gezi Park protests. Image: Chris Vena/Flickr. Some rights reserved.